Last week was a week of many changes and decisions on the Casa construction and some of the design and materials being used. The first surprise was the ceiling in the great room and kitchen. The crew was busy framing out for fur-downs because our civil engineer had included them in the plans. I guess we missed that when we reviewed the specs. I’ve always thought fur-downs, or dropped ceilings around the perimeter of a room, make the room look smaller. That is the last thing we want to do with the great room. In 2008, we remodeled our kitchen and ripped out the fur-downs so we could extend the kitchen cabinets all the way to ceiling. We sure don't want any fur-downs in this house. Fortunately for us, the construction team had only started on the first fur-down in the living room when we caught it and asked them what they were doing. We immediately called a halt to the dropped ceiling look. The next surprise was the roofing material specified for the Terraza and the entryways for the front and back doors. This was supposed to some sort of polycarbonate material that would allow light through and block the ultra-violet rays. The plan was to place this material on a metal structure. We had never seen this stuff installed, so we arranged for an agent of a company that sells the polycarbonate sheets to come with color sample and then we went to see it installed at a home near us. This plastic stuff is not at all the look we are going for with our Spanish Colonial Casa and its clay tile roof. Aside from not being the look we are going for, the polycarbonate sheets are expensive and have a short life expectancy. Needless to say, we squashed this design idea immediately. Rodolfo, one of the construction bosses, informed us we needed to settle on “Plan B” as soon as possible, because the crew would not have enough work to keep them all busy until they could start on the interior spaces, like floors and tile work. John and I talked about what our options were and how we could keep the Spanish Colonial look. We decided to go with wood beams, instead of steel, and clay barrel tiles that will have the underside of the tile exposed. Thursday, our other construction boss, Eliécer, decided we really need to make a shopping trip to look at the types of woods that are available. He took us to an incredible lumber mill about 30 minutes from our house, in Alajuela. The fellow that waited on us started working at the mill when he was only 12 years old and has been working there for 38 years! This guy really knows his woods and he showed us some amazing stuff. We brought back a number of samples to consider over the weekend. On Friday, John put together a new design for the Terraza and entry ways that will consist of heavy 2”x6” hardwood beams made of Areno and 2”x2” furring strips of a lighter wood called Melina. The beams will be mounted to the house with steel brackets. Rodolfo liked the re-design we came up with, so Monday we went back to the lumber mill to order all the wood. Yesterday, the electricians were here to pull cable. Today, the workers are busy floating the walls of the interior of the Casa, so they’ll have a smooth texture, and the rest of them are helping Rodolfo with the structures needed to support the wood beams and barrel tile roofs of the Terraza & entryways. 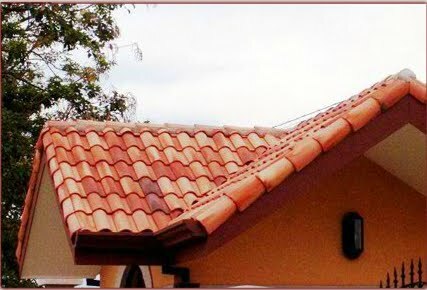 The roofing company just called and they will be here shortly to begin laying the clay tile on the Casa. We also expect the lumber mill will deliver all the wood we ordered sometime today. The rest of the clay tile needed for the Terraza and entry ways will be delivered and installed next week. Lots of activity and things are really starting to look good. The next update will have photos of the clay roof and some of the other features of the Casa that are close to being completed. The barrel clay tiles reminds me of a cool thing I saw at a friend's house. She framed up an area to the dimensions she wanted and stacked clay barrels inside. She used that as her wine rack. The tiles naturally stayed cooler, thus being a good spot to store and display her wines! Looked exceedingly cool and it was amazing how cool it kept the wine.